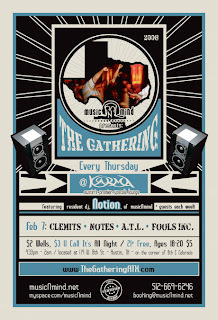 From the neck hurts from laying in bed on the computer department... Don't forget to get another dose of The Gathering @ Karma this Thursday, Feb 7th. Let's see who we've got this week... Clemits, Notes, A.T.L., and Fools Inc. It's 100% Certified Hip Hop!